from Essentials of Classic Italian Cooking, pp. 349-50. Because my friend Gary is famous for his version of this recipe from Marcella’s classic work, I called him today before I started to cook. He remembered that the recipe called for a cube of beef bouillon, which struck him as counter-intuitive. Shouldn’t it have called for chicken? But he urged me to stick to the beef bouillon. Actually, even before I reviewed the recipe and noticed that she specifies only ‘1 bouillon cube’, I remembered reading — perhaps in the first editions of this cookbook — that she disiked chicken broth and chicken bouillon. She tasted bitter to her, and as a result she preferred either a mixture of chicken with beef or just beef alone. So, the choice of beef struck me as the right one. But bouillon cube? Why not my own broth? In the end, I decided to trust Marcella. 1. Soak the rabbit in abundant cold water overnight, in an unheated room in cold weather or in the refrigerator. Rinse in several changes of cold water, then pat thoroughly dry with cloth or paper towels. 2. Choose a sauté pan that can contain all the rabbit pieces without overlapping. Put the oil, celery, garlic, and the rabbit, cover tightly, and turn the heat on to low. Turn the meat occasionally, but do not leave it uncovered. 3. You will find that at the end of 2 hours, the rabbit has shed a considerable amount of liquid. Uncover the pan, turn the heat up to medium, and cook until all the liquid has simmered away, turning the rabbit from time to time. Add the wine, rosemary, salt and pepper. Allow the wine to simmer briskly until it has evaporated, then pour the dissolved bouillon cube and tomato paste mixture over the meat. Cook at a steady, gentle simmer for another 15 minutes or more, until the juices in the pan have formed a dense little sauce, turning the rabbit pieces over from time to time. Transfer the entire contents of the pan to a warm platter and serve promptly. After talking to Gary, I skipped the overnight soak. Let’s face it: the bunny I was about to cook had never set his or her paws on a free range. The gamey taste and stringy sinews were not likely to be a problem. Next change: I add a few extra garlic cloves. I let the rabbit cook until the meat was falling off the bone, in other words nearly two and a half hours. The biggest change occured in the bouillon. I added a beef bouillon to the tomato paste and water. I think it worked. Last bit: I made polenta mixed with parmesan and butter according to the Gourmet Cookbook recipe. Few recipes promise and deliver as this one does. 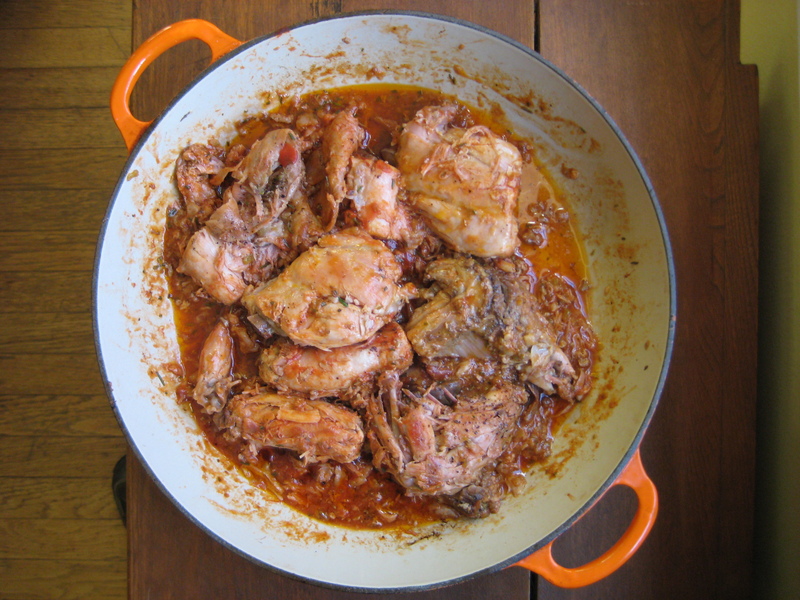 Marcella’s rabbit beats any of the recipes I’ve seen for rabbit ragu over pasta. Next time I’ll make one significant change. I would double the tomato paste-bouillon-water mixture. If I’m not in the mood for polenta, I’d pick the meat off the bone — being very careful to extract the small bits of rabbit bone — and serve it in its sauce over pappardelle. I’m tempted to use one of my precious little tubs of homemade veal stock on this recipe. Something tells me that it would come close to the rabbit dish I used to order years ago at Tra Vigne before the chef changes and they started making inexcusable cut-backs. At any rate, Marcella deserves her plush retirement in Florida.